We're seeing Amazon's Alexa all over CES this year, with the virtual assistant integrated in everything from televisions to lamps to smoke detectors. One of the latest Alexa-enabled device is the LG's Smart InstaView Refrigerator—and while you may question the need for a smart fridge in your home, the Smart InstaView is a hyper-intelligent kitchen helper with a lot of convenience features. 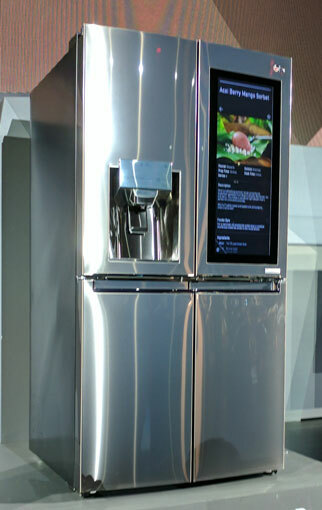 The refrigerator features a massive 29" touchscreen which helps you keep tabs on your food and on your family. Two taps on the screen lets you peer inside the fridge without opening the door—and you can do the same remotely from your smartphone, so you're never stuck at the grocery store trying to remember if you're out of milk. You can add notes indicating what's inside (so there are no more mystery leftovers) and list expiration dates, which the fridge will remind you about. It also acts as a message board: family members can write notes or make to-do lists right on the screen. Since the kitchen is often the busiest room in the home, this makes it an ideal hub for a busy family to keep up with one another. The whole thing is powered by the same WebOS operating system that powers LG's TVs—it's a solid system on their televisions, and it makes for a solid system on this fridge, too. But Alexa is a standout here, because the voice assistant is a real asset in the kitchen. It can search for recipes, order groceries (at least those available on Amazon), set cooking timers, add to your shopping list—all hands-free, so it won't interrupt your cooking. Beyond cooking, Alexa has a host of useful features—over 6,000 skills—letting you control smart home devices, play music and more. All you have to do is ask. It's a relatively similar featureset to Samsung's Family Hub line of smart refrigerators, so your preference of smart fridge may come down to which interface you like better and whether you want Alexa.